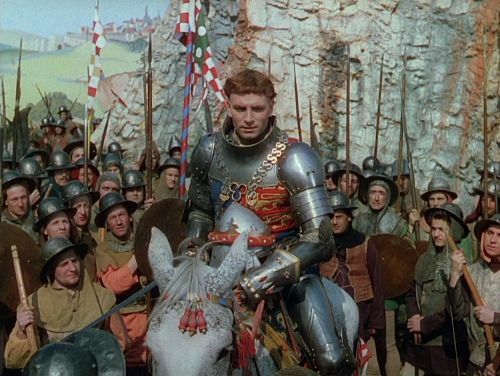 Laurence Olivier's 1944 film Henry V is based on William Shakespeare's play of the same name, one of several historical dramas Shakespeare wrote about British monarchs. The play tells the story of a young English king who puts aside his misspent youth and embarks on a quest to recapture lands in France. This campaign culminates in the Battle of Agincourt in 1415, when an English army defeated a numerically superior French force, with the aid of the English mastery of the longbow. Olivier's film version employs a bold meta narrative, beginning with a performance of the play at the Globe Theatre in 1600. The film opens with a birds eye view of Elizabethan London in a lovely tracking shot over what, to modern eyes at least, is clearly a model, but it's a very good one, complete with swaying trees and fluttering flags. The camera finds the Globe Theatre and gradually homes in on it. Then we cut to the inside of the theatre and the hustle and bustle as the patrons arrive and take their seats. Then the play begins, introduced by Chorus (Leslie Banks) who tells the audience that a story like this, and the battlefield of Agincourt itself, cannot be held within the theatre and exhorts us “on your imaginary forces work”, suggesting our imaginations will give life to the drama. Appropriately for a film directed by a great stage actor, Henry V delights in depicting the details of the theatre in the Elizabethan era, both on the stage and behind the scenes. There's a noisy audience, in-jokes that modern audiences won't quite get, as well as uncertain actors, missed cues and lost scripts. But as the play goes on, the performances become more confident. 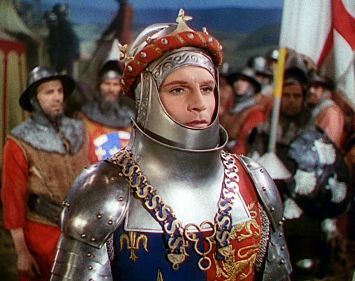 Laurence Olivier as King Henry visibly grows into the role. Most obviously, the scenery becomes more realistic. The audience gradually disappears, then the proscenium arch and then the theatre itself. The settings are opened out and become far larger than any that could be confined within the walls of the Globe Theatre. The sets become more elaborate, while always retaining a theatrical quality, and finally, for the Battle of Agincourt itself, the film bursts into the open into a realistic depiction of a medieval battle on exterior locations. After the battle is over, Henry meets the French Princess Katherine (Renée Asherson) and romances her, and the film brings us back full circle to the Globe Theatre. Henry V is a magnificent work, a triumph of spectacle, colour, pageantry, décor, costuming and writing. It's directed with remarkable confidence and flair by Laurence Olivier, so much so that it's hard to believe that this was his first film as director, especially as he was working under wartime constrictions. The film is a sophisticated marriage of the theatrical and the cinematic and shows a playfulness and inventiveness often lacking in screen adaptations like this. It's visuals are impeccable and the film is handsomely designed (by Paul Sheriff), costumed (by Roger Furse) and photographed (by Robert Krasker), in gleaming Technicolor. It's also beautifully and rousingly scored by William Walton. It draws on medieval art as inspiration for its designs, with the deliberately artificial sets and backgrounds (until the battle scene) based on the visual art of the medieval period, with its bright colours and flattened perspective. The film was intended partly as a wartime morale booster. A BBC TV director, Dallas Bower, was working at the Ministry of Information during WWII. After producing a radio programme in which Olivier read some of Henry's speeches from the play, Bower suggested making a film of Henry V. Olivier asked William Wyler, his director on Wuthering Heights (1939), to direct (Wyler was stationed in England at the time with the USAAF), but he declined, as did Carol Reed. According to some sources Terence Young, later director of the Bond films Doctor No (1962) and From Russia with Love (1963), was taken on to direct, but for whatever reason, he was unable to make the film and Olivier took on the directorial role himself. Olivier enlisted the editor and composer of the 1936 film As You Like It, in which he had also starred, to work on the production, as well as the critic and Shakespearean scholar Alan Dent to edit the play's text. As with his later Shakespeare adaptations, Olivier showed a willingness to give the play a drastic pruning, cutting almost half of its length, some 1500 lines in all. This included losing unflattering elements, such as Henry's killing of enemy prisoners and the hanging of Bardolph, one of Henry's former friends, for looting. The film toys with audience expectations a little, with the assumption that this will be a stuffy and reverent transcription of a play by a Great Writer demolished by its chaotic and tongue-in-cheek scenes in the Globe Theatre. Later it becomes more serious, as it leaves the confines of the stage and its settings become more realistic. The scenes where an incognito Henry visits his troops around their camp fires on the eve of battle are ruminative and atmospheric. Later on it rouses the audience with its sweeping and stirring battle scenes. And finally, it becomes playful again in its moments of romance between Henry and Katherine. The Battle of Agincourt is the film's stand out sequence. It's one of the most brilliantly staged in cinema up to that time, and Olivier probably drew some inspiration from Sergei Eisenstein's Alexander Nevsky (1938). Historians will probably quibble that some of the military tactics are not 100% authentic and the sight of a knight in armour so heavy that he has to be winched onto his horse, although amusing, is militarily absurd. It doesn't matter though, because the battle scene is thrilling and spectacular. It includes a grand cavalry charge by the French knights, filmed by Olivier in a long tracking shot, with the camera riding alongside them as they advance. The cavalry charge, with its driving musical accompaniment, steadily building momentum visually and aurally, is a wonderfully cinematic sequence. Olivier suffered for his art filming these battle scenes, spraining his ankle and dislocating his shoulder, but he was more concerned about not damaging the all-important and expensive Technicolor camera. The battle scenes were filmed in County Wicklow, in neutral Ireland, to provide the numbers of extras required in wartime. As you would expect, the acting is very good. Olivier is on fine form as Henry and Shakespearean speeches can rarely have been delivered with such passion and eloquence. It's a performance of magnificent oratory and declamation as much as acting, but boy is it stirring. Olivier visibly grows in confidence and stature during the film, showing us an uncertain Elizabethan stage actor gradually coming to embody the part of the king he is playing. Olivier is also able to find a humbleness and tenderness in the film's quieter moments, particularly in his scenes with Renée Asherson as Princess Katherine. The supporting cast is made up of notable British stage and screen character actors of the time, including Felix Aylmer, Leslie Banks, Leo Genn and Ernest Thesiger, with John Laurie, Esmond Knight and Niall MacGinnis as the principal Scots, Welsh and Irish characters. Robert Newton plays the scoundrel Ancient Pistol with relish, and for once his ripe hamming is perfectly appropriate for the role. Olivier wanted his wife, Vivien Leigh, to play the part of Princess Katherine, but David O. Selznick wouldn't release her from her contract to play a supporting role, so Renée Asherson was cast instead, supposedly because she could fit into the costumes designed for Leigh. The film's meta narrative enables it to address the audience on multiple levels with different layers of meaning. Firstly, the film is a recreation of the Elizabethan theatre of c.1600 and of the theatrical experience of that era. It recreates the physical space of the Globe Theatre, as well as the performance style, the dramas on stage and backstage and the attitudes and reactions of the audiences of the time and how they interacted with the action on stage. Secondly, Henry V is an adaptation of a Shakespeare play, bringing to life its language, characters and especially its dramatic speeches. Thirdly, and oddly enough perhaps least importantly, it's a historical film about King Henry V, his campaign in France and ultimate victory at the Battle of Agincourt in 1415. And finally, it's a World War II allegory, specifically an allegory of D-Day, depicting an English army (and one with Welsh, Scots and Irish elements), crossing the Channel to fight in France. Inhabiting and underpinning all these layers of meaning is an additional one, that the film is a representation of some of the things that Britain stands for in 1944 – literature, high culture and art, as well as martial skill and courage. As the film was partly intended to be a wartime morale booster, Henry's character was softened and made more heroic, and the role of Scots, Welsh and Irish soldiers in Henry's army emphasised and exaggerated. As a piece of heroic propaganda, Henry V could hardly be bettered, and its message is clear without being too obvious. The film has the cover of being both a historical film and an adaptation of a work by the world's greatest playwright, but I think that the symbolism would have been clear enough to contemporary audiences. Henry's speeches offer just the right level of encouragement and reassurance to a nation whose sons were at that time fighting on the battlefields of Europe, emphasising the bonds of kinship between the soldiers (“We few, we happy few, we band of brothers”), and the glory of taking part in such a patriotic and righteous endeavour (“Gentlemen in England now a-bed shall think themselves accursed they were not here”). Appropriately enough, the film ends with peace and unity between England and France and a pledge for the two nations never to fight each other again. Up to this point, Shakespeare was considered to be the kiss of death at the box office, following a string of flops including A Midsummer Night’s Dream (1935), Romeo and Juliet (1936) and As You Like It (1936). But Henry V broke the curse and became a considerable commercial and critical success, building strong word of mouth after an initially underwhelming response. It helped to usher in an era of prestige film-making in Britain in the late 1940s that has rarely been bettered. It was also enthusiastically received in the US and was Oscar-nominated for Best Picture, Best Actor, Original Music Score and Art Direction-Interior Decoration, with Olivier winning a special honorary award “For his outstanding achievement as actor, producer and director in bringing 'Henry V' to the screen”. The film was probably too arty and too British (at this time) to win Best Picture, but it's nomination was notable. Henry V also wasn't released in the US until 1946, by which time most of its contemporary relevance had been lost. But Olivier would return a couple of years later with his 1948 film of Hamlet, winning four Academy Awards, including Best Picture and Best Actor. 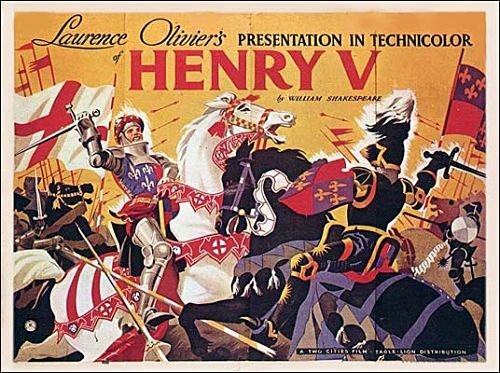 Olivier would direct three Shakespearean films in all, Henry V, Hamlet (1948) and Richard III (1956), often using the same collaborators (including Alan Dent, William Walton and Roger Furse). This trio of films made him the pre-eminent cinematic interpreter of Shakespeare's work. Over the years there have been numerous attempts to update Shakespeare, to modernise it or move it to different places and time periods, especially since the 1990s. 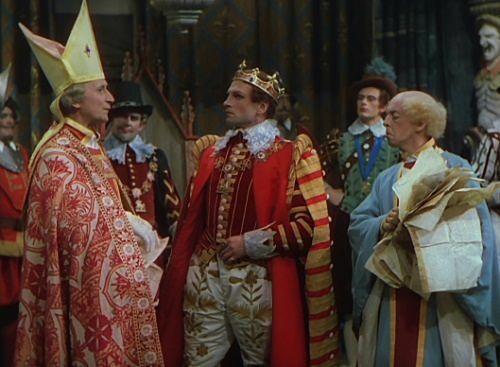 But most look a little gauche and awkward next to Henry V. Olivier's film moves with ease from one era to another, from one style to another, from one form to another and from one layer of meaning to another. It's a film of great artistry and vision, one of the very best and most imaginative Shakespeare adaptations of all, and still one of the most beguiling.